1402: 4 deeps. Approximately year-old naturally mated queen. Defensive bees, though they’ve seemed more relaxed in the past couple of weeks. Resources from this colony have kept and will keep the rest of my colonies alive. (No honey for me this year.) Pulled 4.5 frames of capped honey from 5th deep two days ago (now in storage). May pull 4th deep before winter if it’s full of honey (again, to put in storage for the bees). No inner cover. Empty moisture quilt for ventilation. That’s been the set up for this colony all summer long. 1505 (in the back): 3 deeps + frame feeder. Most frames in top box are full, so may pull feeder this weekend. Late-season supersedure queen = not the largest colony, but large enough, and probably plenty of honey for winter. Slightly defensive bees because queen probably mated with drones from 1402. No inner cover. Empty moisture quilt for ventilation. 1504: 3 deeps + frame feeder. May continue to feed because only a few frames in top box are capped. Another late-season supersedure queen = a small colony (the smallest of the five). I’m hopeful I won’t have to steal brood from 1402. I’m tired of mixing syrup, but I’ll probably continue to feed these bees for another few weeks. We’ll see. Empty moisture quilt over inner cover for ventilation. 1501: 3 deeps + honey super. The only purchased mated queen this year that wasn’t killed. I don’t think these bees are making honey. Will probably put honey super above inner cover this weekend and let the bees eat whatever nectar and honey is in the honey super. Otherwise in pretty good shape. Maybe not a full deep of honey on top but enough. No inner cover. Empty moisture quilt for ventilation. Have had to reduce entrances to all the hives except 1402 because of massive amount of yellow jackets / wasps trying to get in. With more cold days, the bees are beginning to shut down for the year anyway. With any luck, each colony will consists of 3-deeps by the end of October with at least one full deep of honey to keep them alive all winter, though by the looks of it, I think they’ll have even more than that. I’d be delighted if I don’t have to feed the bees sugar this winter. I already have 4.5 frames of capped honey (in deep frames) in storage and I hope to have at least another 10 frames by the end of October (if I don’t already have them in 1402). That, along with a full deep of honey already on each hive — I think we’re in good shape. I’ll remove inner covers and fill each moisture quilt with wood chips probably around mid-October after daily temperatures are averaging less than 10°C and the bees are no longer bringing in pollen. I’ll staple quarter-inch mesh over all entrances at that time, too, to keep out the damn shrews. I have no plans to wrap the hives for winter. The hives are well protected from the wind and they get plenty of direct sunlight. Moisture quilts should keep them dry and warm all winter. A note about ventilation: I currently have a rim with a top entrance hole under the empty moisture quilt for all the hives except 1504. (An empty moisture quilt is basically a ventilation rim.) 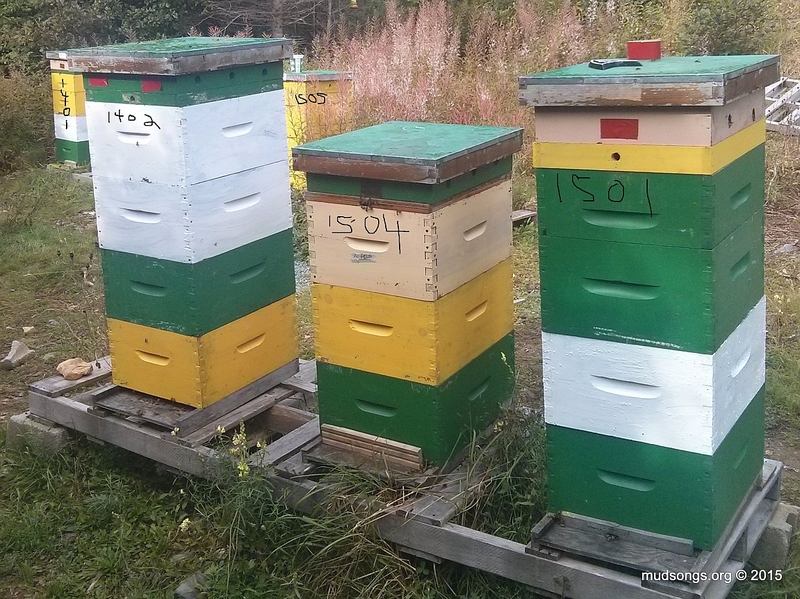 A good example of this is easy to see in hive 1501 with the yellow rim. That’s my general set up for established colonies or colonies that are large enough to keep themselves warm in the summer. I only use inner covers in the summer to keep the heat in with colonies that are too small to generate much heat on their own (usually nucs). There’s more to it than this (e.g., too much ventilation in the spring can reduce the concentration of the queen’s pheromones, which can trigger a swarm), but generally, that’s how I ventilate my hives in the summer. This entry was posted in Defensive Bees, Entrance Reducers, Feeding, Frame Feeders, Mated Queens, Month of September, Queens, Supersedure Cells, Ventilation, Wasps & Yellow Jackets, Year 2015. Bookmark the permalink.